I'd never been on a cruise prior to this trip, partially because of the prohibitive cost, but also it seemed like the laziest mode of travel. I pictured the Carnival ships on infomercials that are essentially floating Vegas resorts, and I didn't understand the point of experiencing something so mundane (eating! drinking! gambling! swimming pools!) in the middle of the ocean, when you could just as well do all those activities at home for much less money. But when I saw the discounted package for this particular cruise and the itinerary (sunrise at Angkor Wat; killing fields outside Phnom Penh), I was intrigued. Our ship, the Toum Tiou II, has fourteen cabins spread between two levels, a dining room and a sun deck replete with wicker furnitures, lounge chairs and a bar. 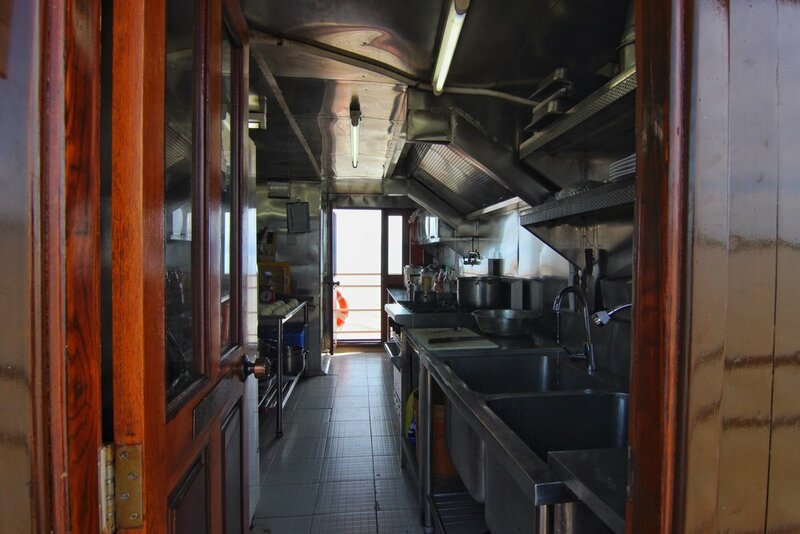 The crew of sixteen takes care of everything from maintenance and housekeeping to multi-course meals. Having done my share of frantic, backpacker-style travel, I have to admit that it's nice not to repack and move every couple days; to know that a delicious meal will be waiting at the appointed time; and to have all excursions and transportation ready and taken care of. The first night on board, my birthday, the chef presented me with a cheesecake after dinner. The lights were dimmed, and the staff emerged with a guitar, serenading me before presenting a traditional Cambodian scarf. Although the ship can accommodate twenty-eight passengers, we are a modest group of ten - two couples from Canada, another from Australia, and a pair of sisters from Finland. My mother and I are the only Americans, and I am, by far, the youngest passenger. Over the course of our voyage we've become a new sort of makeshift family, sharing stories, medicine, travel advice. It will be sad to part ways in Ho Chi Minh City in just a few days. Getting our first view of the ship. Our cabin. We also have a bathroom with flush toilet and shower (with light up shower head). The kitchen, where our awesome staff churns out delectable multi-course meals.